Yesterday I wanted to make cinnamon rolls. I have not made them since my Mother’s stroke when I knew they would have been very difficult for her to swallow and I couldn’t risk her choking. I knew she would want a piece if I made them and I didn’t ever want to have her see them and not get one. 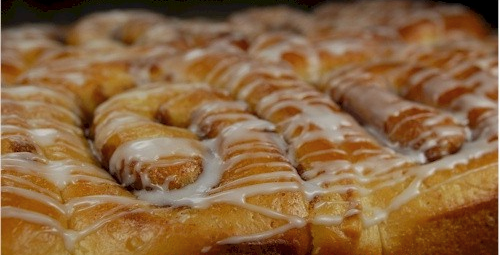 Momma made cinnamon rolls every week. She loved them making them and eating them, as did our whole family. When we were young Momma made more than one pan because friends and neighbors would find out she was baking and always ask her for a roll. Her rolls, as compared to mine, were always much lighter and seemed to remain that way for more than a day or two. They were heaven, just like some of her cookies. Momma taught her self to bake and she was a very good teacher. When I was young, I often watched while she baked and I always wanted to learn. One day when she was gone, I begged my sister to help me prepare to bake a cake. She needed to check if I had measured all the ingredients correctly. I wasn’t too old, just around eight or nine years old. I put the cake in the oven and almost forgot to take it out and my mixing method had never been perfected since I had never baked before. When Momma came home she smelled the cake. It burnt to a rubbery hockey puck. She asked me what happened and finally I allowed her to see the cake. After looking at it, she knelt and hugged me, then gave me a kiss, wiped off the tears from my cheek and gently told me that if I wanted to learn to bake she would teach me. From them on every Saturday was a lesson in baking. With the patience only she could have and the amount of love in her heart, she taught me all she knew. Eventually, I was professionally trained to cook and bake and the older I got I realized how much differently I think of baking and cooking. To this day I bake like my Mother and it is far superior to any professionally baked product and I have proven that many time,s particularly when I owned a bakery. windows to your love and recipes of your treats to make. Each recipe your hallmark passed on to me. Each recipe returns to you Momma with my love and my thank you. Posted on December 20, 2008 September 5, 2010 by suntithenaiPosted in Momma, RememberanceTagged cinnamon rolls, poem, thank you. Yes, you would have loved her cinnamon rolls and sparkle you woud have loved being around her because she would have adopted you–she was smart and could feel things like you grew up with. She adopted a lot of little ones as they grew and didn’t get much from their parents, but she also had a big heart with lots of room for my sister and I none the less. Awwwwwwwwwww, that is so sweet! I remember my mom teaching me to make cookies and I made all of the family’s cookies after that for years! My favorites were, and still are, oatmeal raisin cookies!